Below is a Google AdWords campaign strategy and post-campaign report for a Search Engine Marketing (SEM) campaign for the Canadian Women’s Hockey League. The AdWords marketing campaign was planned and done by a team I was in for the Google Online Marketing Challenge and also as part of a web marketing class at the University of Toronto taught by Michelle Pellettier. The Canadian Womenʼs Hockey League (CWHL) was established in May 2007 and considers itself to be a premier professional female oriented hockey league as many of the athletes also play at the Olympic level. Five North American teams from Boston, Brampton, Burlington, Montreal and Toronto participate in the league and strive to win its annual Clarkson Cup Championship event that will be the focus of this challenge. Event that will be promoted in the Google Ad Campaign is the 2011 Clarkson Cup Championship runs from March 24-27, 2011 at the Barrie Molson Centre in Barrie, Ontario. The CWHL resides in the broader market of hockey leagues for top players and specifically, leagues for women in North America. The CWHL’s main product is entertainment through hockey games and revenue is in the form of ticket sales for hockey fans of all ages. CWHL marketing is mostly online initiatives with teams employing community outreach. CWHL.ca is the main marketing vehicle that encompasses game reviews, news, schedules, scores, up-to-date statistics and team pages which together provide fans direct access to the league. Four Ad Groups will be used to start, focusing on ticket sales, event timing, players, and location. More Ad Groups will be incorporated once key word popularity and quality score data is available to analyze. Since “Clarkson Cup” is practically a non-active key word, generic hockey related keywords will be used so that the ad is posted to users looking for hockey related information. Searches by geography are relevant since potential ticket buyers would likely be associating their search with certain cities due to their travel plans or place of residence. Searches by date may be relevant to users so the month “March” should also be included as a keyword. Additionally, the names of certain current star athletes in the League will be included as key words. Only display the ads for Search, not Network. The Clarkson Cup Championship took place March 24-27 at the Barrie Molson Centre. Use 100% of the budget but not all of it before the Clarkson Cup i.e. put a higher budget allowance on the days immediately preceeding the Clarkson Cup but allow for allocation of the budget for days after the Clarkson Cup since there could be web site interest generated as a result of off-line publicity that would benefit the league. A) Targeted adword groups were established. B) Keywords in each ad group were adjusted regularly based on performance. C) Key word bidding was initially done manually then switched to automatic bidding. D) Ad copy was revised frequently in order to experiment with the success of certain wording in generating hype and interest. Barrie Molson Centre Games – hockey games in the geo-location. Continuous monitoring resulted in the realization that the ad copies should be enhanced to create urgency and excitement. The budget was again increased several times through the campaign and event time. With an aim to further heighten excitement and urgency a new ad featuring the 2 teams that made it to the championship match to be played the next day was prepared and called “Championship Match”. After the championship match the final ad aptly named “Championship Results” was created with a focus on the results and used the names of players especially of the two final teams as keywords. Ultimately, these changes increased the number of total clicks and impressions and ensured that the $200 budget was spent. Figure P1 is a graph shows the number of clicks and impressions during the campaign. The initial campaign had almost no impressions and money spent. Total Impressions Clicks CTR Avg. CPC Avg. Pos. The display network created many impressions, but had a poor CTR compared to search. Each ad group had strengths which are bolded in blue below. Buy Clarkson Cup tickets from $10! 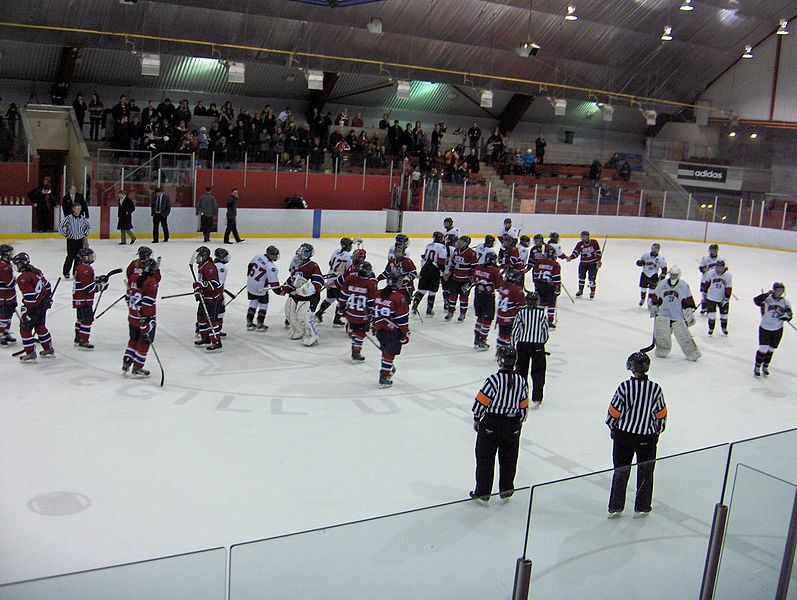 MTL defeats TOR 5-0 for hockey cup. View all championship stats here! Today @ 1pm, Buy tickets only $15! The tickets, women’s hockey, event results, and sponsorship ad groups generated a large number of impressions. The geo-location ad group performed significantly better than other ad groups in CTR. The sponsorship and female hockey player ad groups both performed well in generating impressions and driving traffic to the landing page. Figure P2 is a graph showing campaign costs and clicks during later part of campaign (March 22 – April 2, 2011). Keywords that were the most effective involved the geographical location of the event promoted by the campaign combined with women’s hockey phrases. Names of some hockey players and Scotiabank sponsor produced good CTRs. The ineffective keywords were similar to the top performing ones (some hockey player names), but were usually less relevant to the event or were less popular variations of the effective keywords. The large number of impressions and respectable number of clicks for the campaign was a success for a growing market for hockey game tickets for the CWHL. Optimizations described above met with expected results and immediately boosted impressions and clicks. One failure was to obtain sufficient data in the first couple weeks of the campaign due to tight restrictions on the budget and CPC. This was the first time a campaign such as this was carried out, therefore it is not possible to compare this year’s results with those of previous years. The campaign results were within the client’s expectations and will serve as a basis for future SEO campaigns, which according to the CWHL leadership, is a worthy outcome. The most effective way to leverage an online/SEO campaign would be to “sell” the product or service online; in this case, ticket sales. Since numbers demonstrate a peak in impressions and CTRs during the even -> search engine marketing is influenced by other external elements of the marketing mix, such as PR (news media), advertising, social media, and the proximity of the event. Keywords and ad copy should be adjusted and/or changed, in order to reflect what is happening in overall marketing and media. The geographic location ad group had a significantly higher CTR than other groups, which demonstrates that the local geographical campaign should be a focus point of any future marketing plans for this league. Tickets can be sold online directly on CWHL’s website or CWHL can partner with a ticket provider such as Ticketmaster. The online sale of tickets will make it easier to calculate conversion rates, create convenience for fans and ad copies can improve. Creation of a competition to win free tickets to lure fans and peak the interest of undecided persons who may be contemplating on attending a game. Deal on landing page -> “buy weekend package get 1 game free”. This deal can be used as a very effective call to action in a future ad. Installation and use of Google Analytics can also be considered. Valuable data such as keywords derived from traffic sources can be collected from this tool and used to streamline both online and offline marketing campaigns inclusive of Google AdWords. Campaign performance details, on-site visitor behaviour, ad conversion rates and landing page performance all generated by Google Analytics can help in the decision making process during a Google AdWords marketing campaign. We succeeded in those learning goals, but feel more can be learned from observing campaign progression and optimization of ad groups and campaign settings. To balance team responsibilities later in the campaign, we found it easier to distribute ad groups to people and have them optimize the keywords and ads in them. Also, two leads would handle new ad group creation and campaign settings like budget and ad serving. The initial part of campaign was unexpected when the daily budget and CPC was set low to generate enough impressions and clicks to give meaningful feedback on campaign performance. Later part of the campaign had an expected outcome of the growth of clicks and impressions with campaign settings optimizations. The team would choose to obtain initial feedback on the campaign through clicks and impressions from the Google Ad Words metrics by setting higher daily budgets and more geographical locations and then optimize based on that data. This work is licensed under a Creative Commons Attribution-NonCommercial 3.0 Unported License unless otherwise indicated.